Message summary: By our nature we may not like warnings, but they are given by a caring God for our good. We should be thankful for God's warnings and actually see them as evidence of His love. May God help us to keep our focus on Christ and the life of trust and obedience to which He has called us! "Our kings, our leaders, our priests and our fathers did not follow Your law; they did not pay attention to Your commands or the warnings You gave them" (Nehemiah 9:34). "Now these things occurred as examples to keep us from setting our hearts on evil things as they did" (1 Corinthians 10:6). "These things happened to them as examples and were written down as warnings for us, on whom the fulfillment of the ages has come. So, if you think you are standing firm, be careful that you don't fall!" (1 Corinthians 10:11,12). Anytime we're at the shore we enjoy seeing and when possible visiting lighthouses. 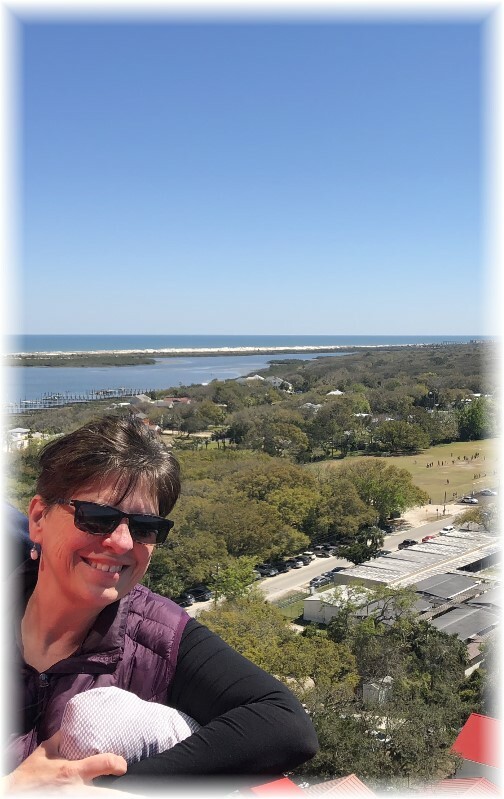 Last week we toured the Saint Augustine lighthouse in Florida and walked up the 219 steps for a panoramic 360 degree view. I have a friend who has taken photos of most lighthouses along the east coast as well as the Great Lakes lighthouses. They are a distinct feature of life along the shore. But lighthouses weren't built to be tourist attractions or scenic structural art. They were built for function, to warn ships of danger and to guide them to safety. 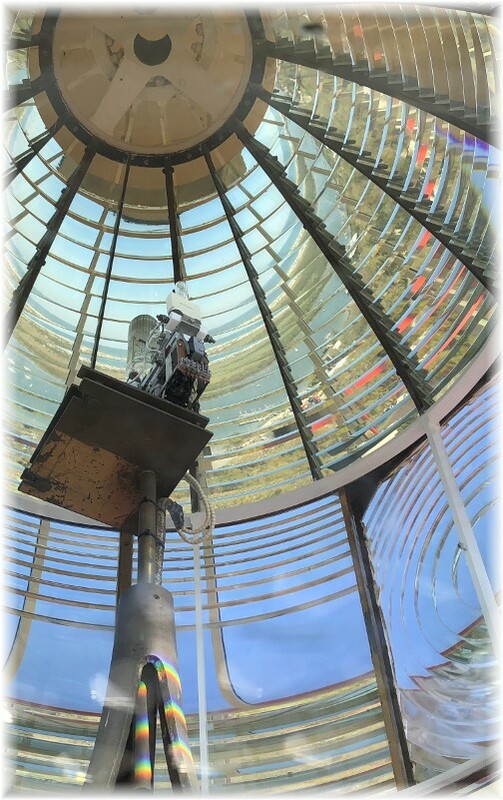 Lighthouses mark dangerous coastlines, hazardous shoals, reefs, and safe entries to harbors. Can you imagine the consequences if the captain's value of a lighthouse was merely as a scenic attraction? We get a lot of warnings in our lives. Warnings abound in our homes, our cars and even in our computers. There are seven warning signs for cancer. We can ignore or disable warnings, but we do so to our own peril. But far, far more perilous is the widespread disregard of warnings from God; either from Scripture, experiences in life, heavenly messengers, or the still small voice of the Holy Spirit. The greatest warning involves our most definite future judgment. These warnings are not only massively ignored, but mockingly ridiculed, much to Satan's pleasure. In fact just today Brooksyne was on the phone talking to an individual about a relative who recently passed away. The caller joked that given his health problems he would be the next one to die. When she brought up the subject of eternity, hoping to get in a witness for the Lord, he chuckled as he commented, "It's all a myth anyway!" Sadly, this individual who doesn't know Christ as his personal Saviour is disregarding the message or warning God is giving him through Brooksyne. In the first verse today from Nehemiah, a group of Levites are exhorting the people who have returned from the Exile. The apostle Paul wrote our 2nd daily verses initially to the believers in Corinth and now as part of the canon of Scripture to all of us. He is urging believers to stay faithful to their call to follow Christ. Today's verse is a vital warning we must not postpone or ignore. "These things" refer to the various experiences the people of God had following their exodus from Egypt. Paul said these "occurred as examples". He uses examples from their experiences, all of which are recorded in either Exodus or Numbers. He ends the section by repeating: "These things happened to them as examples and were written down as warnings for us, on whom the fulfillment of the ages has come. So, if you think you are standing firm, be careful that you don't fall!" (1 Corinthians 10:11,12). Today we are among those to whom "the fulfillment of the ages has come". Yet we, like the Corinthians, still struggle with "setting our hearts on evil things". By our nature we may not like warnings, but they are given by a caring God for our good. We should be thankful for God's warnings and actually see them as evidence of His love. May God help us to keep our focus on Christ and the life of trust and obedience to which He has called us! Daily prayer: Father, all throughout Scripture we hear Your warnings but there is much that we cannot foresee nor do we understand. Some of this understanding will fall into place as we have opportunity to look back and see how You were at work, though Your hand was not visible at the time. We want to trust in You with all our heart and not lean upon our own limited understanding. As we trust You fully, we will obey You faithfully and Your blessings of favor will fall upon us. Amen. Study note: Our earthly nature tends to find God's warnings annoying, often disruptive to our plans, and they are so often ignored. After all, in many cases, the consequences of ignoring them are not immediately apparent. Thus the tendency is to feel the warnings have no value. Many have sought to "remove the batteries" from God's beeps; doing all that is within their power to silence them. We see these never-ending attempts to silence the beeps through the secular media, liberal theology, revisionist history, political forces, the entertainment industry and many other godless venues. The Apostle Paul is referring to these warnings in the second verse. We should learn and understand that God's warnings are not a source of annoyance but an expression of His love, just as a parent who loves their child warns of potential danger. This is a very important truth to hide deep in our hearts as we seek to live in a manner that pleases the Lord. "Therefore be careful how you walk, not as unwise men but as wise, making the most of your time, because the days are evil. So then do not be foolish, but understand what the will of the Lord is" (Ephesians 5:15-17). focusing on our visit to Saint Augustine, Florida. 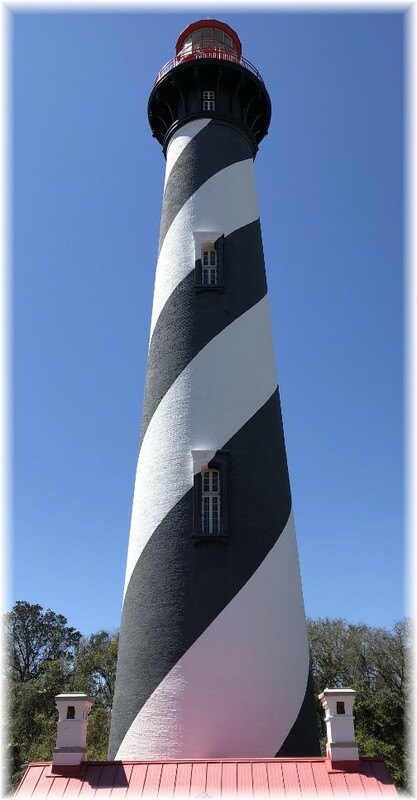 We climbed the 219 steps to the top of the Saint Augustine lighthouse for a 360 degree view. A view of the inside of the lens. 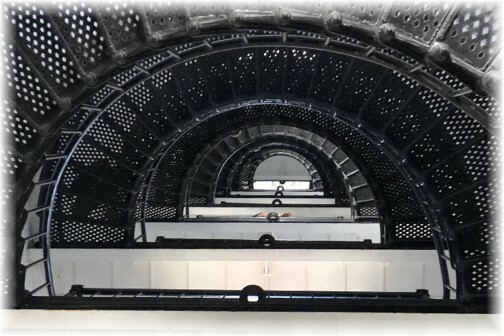 The inside of the lighthouse through the circle stairway. 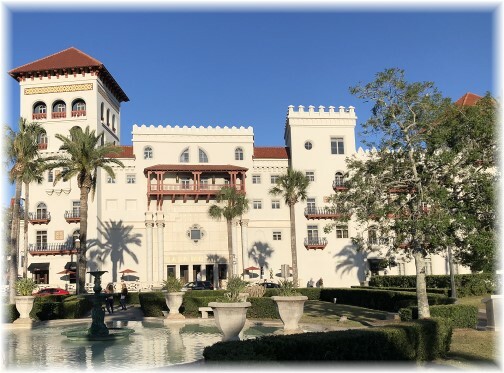 This magnificent hotel is in Saint Augustine. 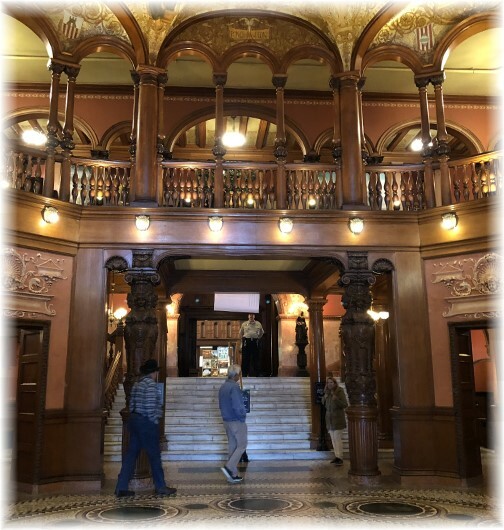 This was the lobby at Flagler College which was originally a hotel. The inside of the lobby was as ornate as a capitol building. A view to the inner gardens. Saint Augustine is set up to demonstrate the history of the area beginning with the Spanish. 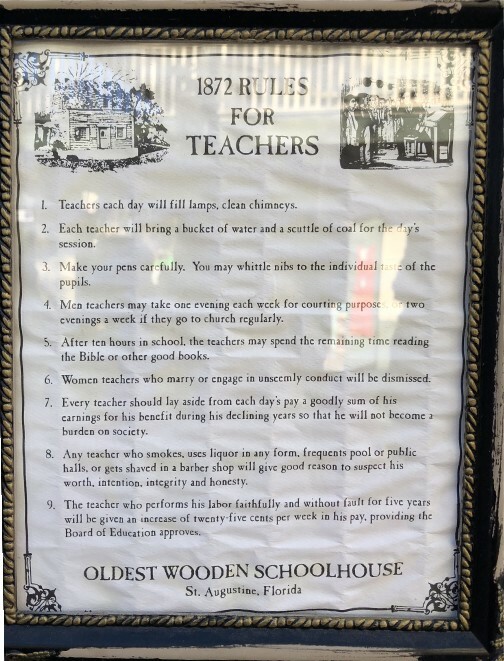 They also had the oldest wooden schoolhouse in Florida with these rules for teachers. We wonder how these rules would go over today? 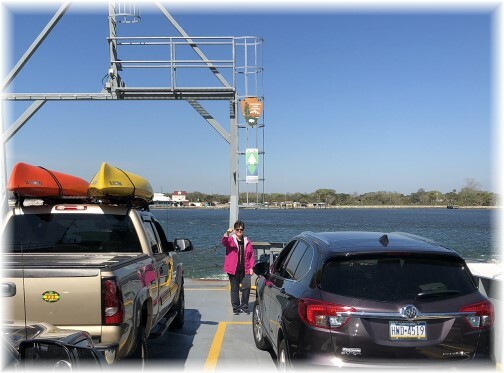 Leaving Jacksonville we didn't take the interstate as we did when we came but rather rode a ferry across the Saint Johns River. Cesar, my brother-in-law, is from Venezuela. 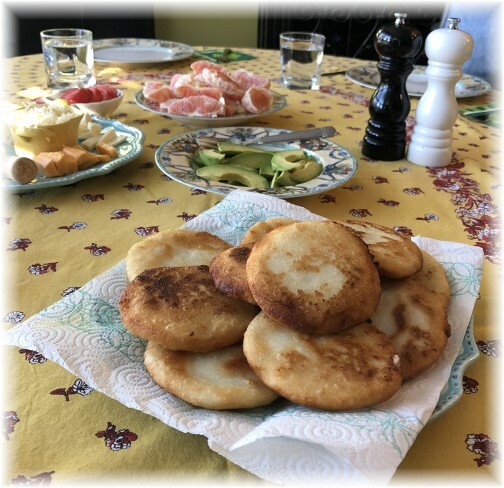 A highlight each time we visit their home is when he makes Arepas and fries them in the skillet! Arepas are made of corn meal prominent in the cuisine of Colombia and Venezuela. It is eaten daily in those countries and can be served with accompaniments such as cheese, veggies, meats and avocado or if you want it sweeter spread butter with jelly or honey. We had it both ways and each serving was delicious! Yesterday I attended a "Taking Sunday Faith into Monday Work" conference at Lancaster Bible College. The theme was to encourage Christian business leaders to see their work and company leadership as part of Christ's mission. Both Rick Caldwell and Sid Raisch are a part of Convene, one of the event sponsors. They seek to lead their companies with Christian principles. 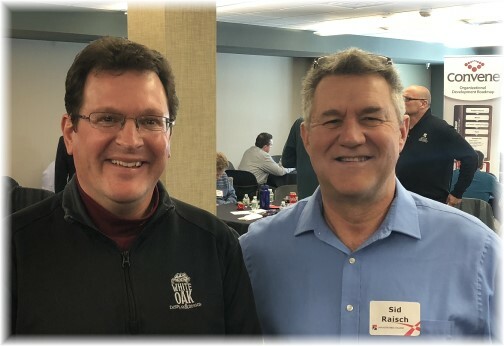 For ten years we have served Rick's company, White Oak Display and Design, as chaplains. Sid leads Bower and Branch, an online nursery. 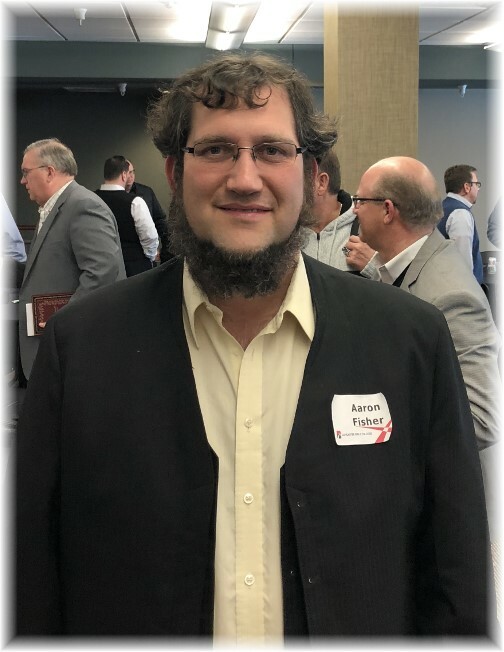 Aaron Fisher leads an organization known as Blessings of Hope, a food distribution ministry that was set up to allow large food distributors to efficiently donate to the community. The food is received, stored, and distributed to smaller food ministries, outreaches, and families in need within the community. 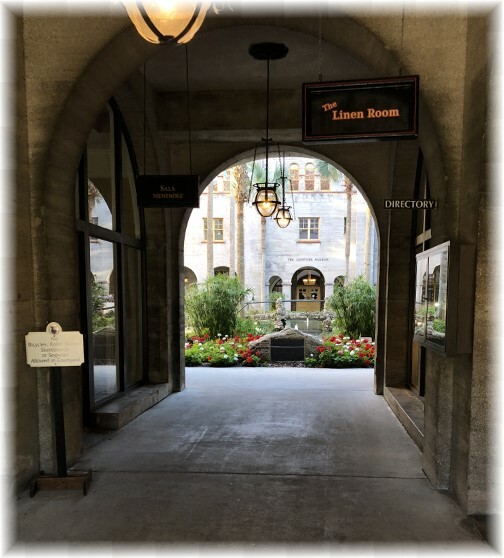 Here are two videos that may bless and remind you of the sanctity of work and a consideration of needs people may have. 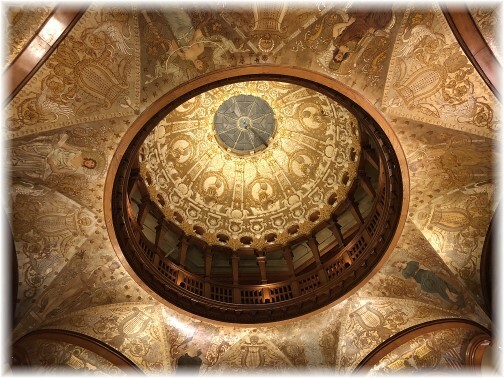 "Freedom to Flourish" Video (2:32 minutes) A great perspective on honoring God in all we do. "Every Life Has a Story" Video (2:48 minutes) This training video from Chick-fil-A, one of our favorite national companies, is used to help their employees to consider what troubling circumstances their customers may be going through. Very touching.